I just blogged about how I simplified my home network with a MoCA/Ethernet bridge. 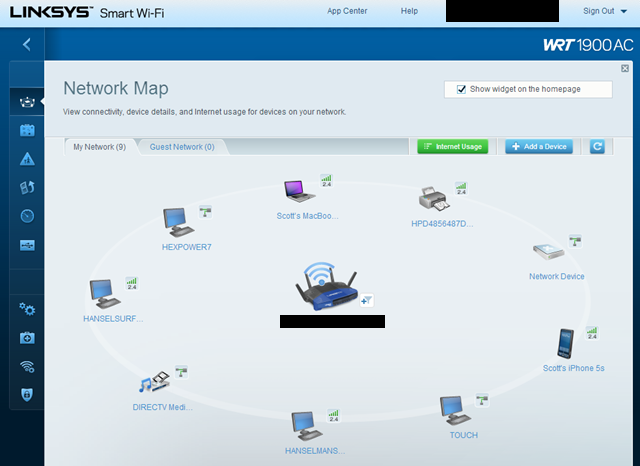 As a part of my home network rebuild, I swapped out my Netgear N600 for a shiny new Linksys WRT1900AC Wireless Router. I've been a Linksys WRT54G fan for almost a decade. I ran HyperWRT for a while and then ended up with DD-WRT. Having a reliable, hackable router was a joy back in the day. 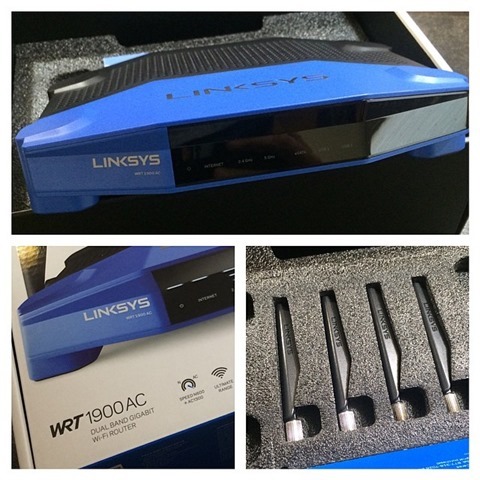 The new Linksys WRT1900AC has a design that is clearly meant to evoke the WRT54G, but it's a whole new beast. My first WRT54G was a Broadcom BCM4702 running @ 125Mhz, although later models went to 240Mhz. It had 16 megs of RAM and 4 megs of Flash. I was thrilled that theh WRT54G had "fast ethernet." Compare that to the WRT1900AC with its dual-core 1.2Ghz ARM processor with 256 megs of DDR3. It's a PC, frankly, and I appreciate the power and flexibility. This router is clearly a little spendy, and I was initially wondering it US$249 is worth the money. However, after using it for a week I can say yes. Let's say that it only lasts a year, that's less than $1 a day. If it lasts 5 years like previous routers, it's pennies. Considering that I work from home and need consistent and reliable connectivity, I'm willing to pay a premium for a premium device. First, this is a 802.11a/b/g/n router and supports all devices, including the newer 80.11ac spec. It cover the full spectrum, pun intended, and has both 2.4GHz and 5.0Ghz support. It's got 4 large adjustable antennas, and the whole device is the size of a medium pizza. They even warn you not to put stuff on top of it so you don't block the heat sink. I was also pleasantly surprised that the WRT1900AC has a USB 3.0 port and an eSATA port where you can plug in external storage, then access it as a file share. I was just talking to a neighbor who was considering a $600 NAS (Network Attached Storage) device, and I see now that the WRT1900AC could be that basic NAS for him. It supports FAT, NTFS, and HFS+ filesystems. It's also super fast. Here's a large file copy for example. It's fast and rock solid at 100+ megabytes a second. 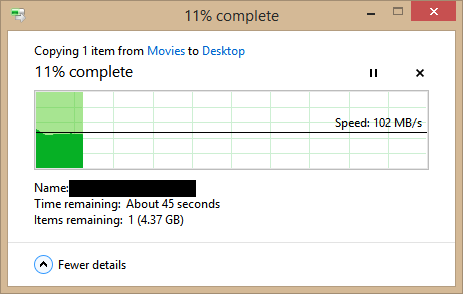 I'm getting between 40-60 megabytes a second over wireless. I've also been able to get 20-40 megs a second off an attached hard drive. It's a competent simple NAS. It's been consistently faster than my previous router in basically everything that I do. I haven't done formal tests, but it's looking like 20-30% just on the wireless side. The WRT1900AC also will support OpenWRT later this year, and Linksys is encouraging folks like the DD-WRT, Open WRT, and Tomato projects to target this device. It's nice when a company creates hardware and doesn't freak out when the community wants to hack on it. The installation was a breeze and I was impressed that they included a non-standard default password for out of the box security. Their initial release of the built-in software is a little lacking, IMHO, in a few areas, most notably QoS (Quality of Service) and is a little bit of a step back from my previous routers. I'd like more absolute control over my traffic, but that's me. To compensate, I marked my Xbox and my Work PC as needing preferred packets, so rather than prioritizing specific traffic, the router will prioritize these machines by MAC address. While it does lack in some places, it makes up in others. The interface is fast, and easy to use. You can access lots of logs, diagnostics, and stats for everything. However, I have spent most of my time in the Network Map. Not to harp on this feature, but I really like this real-time filterable network map. From here I can see who's on which wireless channels, reserve DHCP leases, filter devices by type. It's a gimmick, but it's a gimmick that works and works well. All in all, I'm very satisfied with this new router. I've got greater wireless coverage than ever before. I've got good management tools, inside, outside, and while mobile. The speed is as good as anything I've ever used. It has 90% of the features I need, and I'm confident I'll get more advanced features with updates or via open source projects. 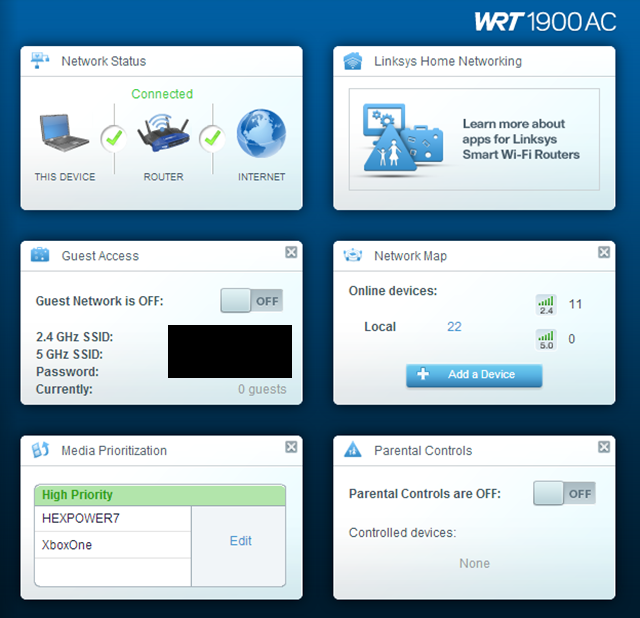 For now, the Linksys WRT1900AC Wireless Router is sold only at Best Buy or on Linksys.com direct. It's worth the money if you want the fastest router out there. * Disclaimer: I use affiliate links to buy gadgets and tacos. Click them and you support me, my lunch, and my blog. Can I run zrouter on it? Thanks for the quick review, looks very nice. It might be worth mentioning that it's backwards-compatible with a/b/g/n but fully supports AC. I was confused when reading the article about how a router with AC in the name wasn't broadcasting via the AC spec. Only on the product page were my fears quelled. Still way too expensive for me, but looks like a great option for demanding home networks. Have you tried running the old NetGear N600 as a secondary wireless access point/extender/repeater with the same SSID (or is the Linksys so good you don't need another)? I bought the N600 a while ago, based on your review of that. But I still have lousy coverage upstairs due to my lathe and plaster walls (and brick/stucco exterior), and never set up an extender like you wrote about as well. I still haven't found a wireless router that can get through my walls, and while the Linksys probably is stronger than the N600, I don't have faith it'll be that much better. But if I could get better coverage downstairs while leveraging the N600 upstairs, it'd be a win for me. I currently am using buffalo. With this one how is the range with lots of walls? I see you said the range is far better; but is it with a fair amount of obstructions? Derek - Good point. Fixed. Adam - So far it's making it through quite a lot of wood and I can still watch Netflix. It's definitely better than the N600. It's gone from 3/5 bars to 5/5 on my iPad. Pauses and buffering are gone. Have you moved the antennas or added a cheap external antenna? Have you checked out the Asus Dark Knight? I have the older model at home (doesn't do ac) and it's pretty solid. It gets firmware updates often enough and can be completely controlled/configured remotely. If you have I was wondering how they compare. Hopefully they'll sort out the OpenWrt support soon! I'd love to be able to hang my printer off the guest network and still access it from the main network. Any idea if this is doable with the wrt1900ac? What's the power consumption like compared to the old one? In some parts of the world, this matters. I have this dual band dual radio linksys e4200 (http://support.linksys.com/nl-eu/support/routers/E4200) but I am a bit disappointed about the speed and coverage. I thought about buying the netgear n600 because of the review on your blog and other online benchmarks. But perhaps Linksys is only really good with the wrt1900ac and the good old (and legen-(wait for it)-dary) wrt54g. I have had a recent experience with a netgear n600 which crashed when I contacted the webinterface from a win 8.1 pc. So perhaps my next router will be an asus as Clay suggested. Just to see if it is better then linksys and netgear, or maybe even because the cool name "dark knight"
Great to see the original Linksys brand back in the game with good products! I think being acquired by Cisco always let people wondering if the company would ever be the same. Awesome review, you hit all of the useful highlights. One thing I'm curious about is how it performs in a mixed wireless environment. I have a Linksys E4200 that replaced my very functional WRT54G running Tomato. I upgraded so that I could get the benefit of Wireless-N for my phones and tablets, but keep the G network running for the 5 Logitech Squeezebox players we have scattered around the house. I setup the E4200 to run Wireless-G only on the 2.4GHz band and Wireless-N only on the 5GHz band. The result is that the G network is solid and in most spots of the home, has a very strong signal. The N network, regardless of where I am in the house does not have as strong a signal, and as a result the phones and tablets (all of them Android) tend to favor connecting to the G network, so this was a bust in my opinion. Any comments that you or any other reader might have are appreciated. Might need to stop at best buy on the way home tonight... Temptation... 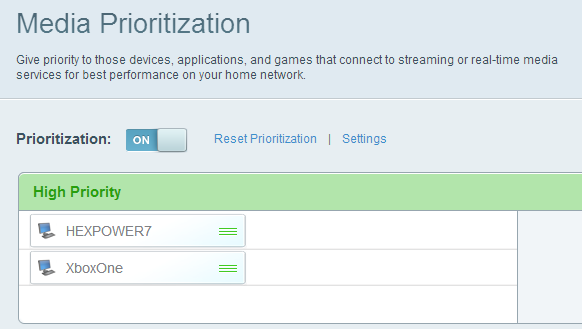 I like my Asus RT-N16 just fine but could use more throughput on the wireless side. Best I can get wireless on my N16 is 30mb. My wired connection does a solid 56mb. Do you think this would have better throughput and signal strength? I haven't yet added an external yet. Been thinking about doing that or adding a second router as a cheap extender. The problem I always have with these is that wired outlets often terminate in a metal box in the laundry room, basement, closet, etc. I can put a wired-router in there no problem, but it's like a Faraday cage for the wireless. I usually go for a wired-only router and a separate WiFi access point. If you want something a bit easier on the wallet: ASUS RT-N56U (not the newer models, that specific one). It claims to be the fastest router in the world and I'm thinking they are being honest - it has a hardware NAT and other goodies you just don't see on consumer devices. What are you using on the client end to via WIFI (don't care about your appliances, just what can be swapped)? Did you have to change anything out on those to improve the connection? I always try to get a Linksys router whenever i am upgrading or just flat out replacing an older model, they are generally more consistent and achieve the amount of bandwidth i need. Thanks for the review. Do you use Lync from home? We have had reports of spotty Lync connectivity while our users are connected from home. We're looking for a consumer device that we can send home with people. Any thoughts on your Lync experience over this or other wireless devices? Good review. Just wondering though... Is there any SNMP access/support on this beast? Guest network is separate. Printer will not cross both networks. In my experience, I no longer am needing an extender, range is stellar even in my garage and outside my home (~2500 sqft). Incidentally. After posting my last comment I stumbled into this thread at the Linksys forum where people were being urged to try setting the MTU to MANUAL/1500 instead of AUTO (the default) in the connectivity blade under INTERNET SETTINGS. No one mentioned my specific problem, but it seemed worth a try. Or...maybe my phone at that post. To clarify since the first post is missing: PCs were fine, but phones all seemed to be struggling to access media from within apps (photos in Instagram and Facebook were always missing in the apps, but always present in the browser). Anyway, set the MTU to manual/1500. It appears to be a cure-all. I have a Netgear N900 which I am told by Netgear can only be attached to my network via the cable modem. As this point is at one end of my house it makes range very limited. Does the new Linksys WRT1900AC wi-fi router need to be connected DIRECTLY to the cable modem, or can you place it anywhere in the home network that has a cat 5/6 port? Warn against buying this machine! This is the worst router on the market! And while the most expensive! Scary, is not stable. The device is able to suspend / restart after a few hours. Software is poor. The range and performance is average. And what is the worst! Support do not know, and help is none! 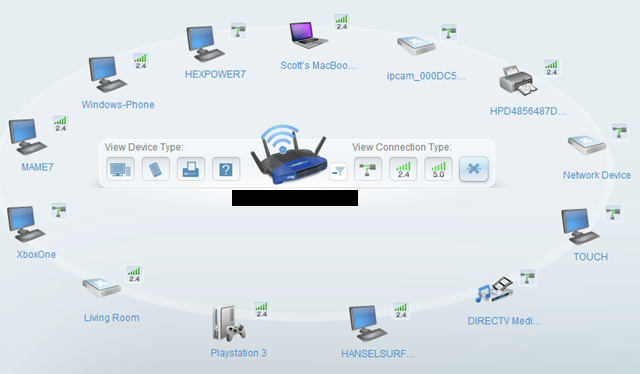 Please try to read the forum company linksys, the same problems! max-bit - OK. I haven't had any crashes or reboots since I turned it on. Scott - This router rocks. A friggin dual core processor in there.... that's what's up. Have you found anywhere to monitor the processor temp or manage the fan speed? I have had the wrt 1900ac since 4-23-14 and have spent two complete days online with the tech reps and still can't get past dial up speed. only the 2.4 ghz seems to work and only get dial up speed on it. I have worked with the internet provider and had modem checked and it is ok. When hooking direct to the modem I get 8 gb but hooked to the router I get that when first hooking up or reseting the router but it starts falling off in just a few minutes and about 5 minutes it is back to dial up speed. I have spent hours and hours and still don't have as good connection as with the wrt54g. They do have people to help you but they can not fix it. Asus is completely without tech support. I have a lot of stuff and that is why I spent 300 dollars for a router that was suppose to be a rolls but is maybe a model T ford as far as I can see. I will spend another complete day with them and then try to return it and go to walmart and just settle for a elchepo. Do you know if it will support multiple SSIDs? The one I have now lets me have a 'Guest' SSID that provides access to the internet, but is totally separate from all the devices on my home SSID. Also, have you seen the http://amzn.to/1ll2y6Z WRT1900AC-EJ? It's only a bit more expensive. Thoughts on that over just the WRT1900AC? Scott, how is the logging on this? Most routers are pretty sad--if you're lucky you can get an origin and a destination and a protocol (like my EA4500, which I bought only because my WRT54G+DD-WRT gave up the ghost). Like many internet providers these days, mine is starting to tie GB to costs. I'd like to be able to see which device (=== which person) is sucking up the GB. I struggled to find the range it covers,but dint get to know whats the range. I also want to know your opinion that increasing number of devices connected to this beast affects in the speed of internet being supplied to each device?